Liverpool's defeat at Hull City erased any lingering hope that the cracks that have emerged at Anfield this season would be papered over by the consolation of Champions League qualification. It was a year ago that captain Steven Gerrard's fateful slip against Chelsea put the skids on what was looking like a thrilling, and completely unexpected, Premier League title triumph. And it is also the 25th anniversary of Liverpool's last title win, a galling statistic for a club that almost regarded that domestic crown as its personal property. Coming hard on the heels of a dismal performance in defeat by Aston Villa in the FA Cup semi-final at Wembley, another late season collapse has left manager Brendan Rodgers facing serious questions. Can Rodgers manage the big names? He proved he could handle Luis Suarez, coaxing the best season of his career from the combustible Uruguayan as Liverpool almost won the league after getting tough with him when he wanted to leave in pre-season. Rodgers also helped Daniel Sturridge to deliver the finest form of his career when he was fit after unfulfilling spells at Manchester City and Chelsea. Steven Gerrard's departure was always going to be a hospital pass for one Liverpool manager and it landed at the feet of Rodgers. The debate about whether he was offered a contract early enough continues and is more of a question for Liverpool's hierarchy but the brutal truth is Gerrard's form this season proves the time is right for club and player to part ways. "Liverpool have won seven of their eight Premier League games without Steven Gerrard this season (88%), compared to 40% with him (10 of 25). Rodgers is also in a no-win situation about when to play Gerrard. The 34-year-old was heavily criticised for his display against Aston Villa at Wembley and yet Rodgers was then questioned for leaving him out at Hull City. It is a delicate balancing act. As for Raheem Sterling, it is hard to see how Rodgers could have handled him better. He even allowed him a break in Jamaica at the turn of the year to recharge his batteries. It is clear Sterling's relationship with the club itself is now fragile but it is tough to see how the blame could be pinned on Rodgers, who has been nothing but supportive. The idea that Sterling has become disaffected by being played out of position is also a myth. Is Rodgers good enough tactically? How quickly the game can change. Only a few weeks ago, on the back of a 13-game unbeaten run stretching three months, Rodgers was being hailed as a tactical visionary. After a Champions League loss in Basel, Rodgers switched to an unfamiliar 3-4-3 formation with summer signing Emre Can looking accomplished in an unfamiliar defensive role. It worked superbly as Liverpool moved up the Premier League and towards the FA Cup semi-final. It all came tumbling down at Wembley as Rodgers was outmanoeuvred by Aston Villa (Liverpool were "bamboozled" according to Villa manager Tim Sherwood) and lost. The back three was ditched for a back four after 20 minutes, then at half-time Mario Balotelli was introduced and Steven Gerrard removed from an advanced role. For someone regarded as so creative tactically, it was a mess and a mess at a very bad time. Rodgers may argue that the failings of his players forced him to switch tactics and he will have a point - but he currently seems to be struggling to identify his best team and best formation. The scale of the debacle that is Liverpool's transfer policy can be underlined by a Rodgers quote that has been revisited in recent times. Commenting on Spurs' rebuilding after the sale of Gareth Bale to Real Madrid, Rodgers said: "If you spend over 100-odd million you'd expect to be challenging for the league." Rodgers (or perhaps in view of the existence of the infamous 'transfer committee' at Liverpool, the club) did spend that sort of cash. And they did not win the league. The work in the transfer market has been the biggest failure of all. Liverpool's recruitment under Rodgers and the committee has been abysmal. Large sums of money have been squandered on rank inadequacy. Twenty three players have arrived under Rodgers and the committee. Very few, such as Philippe Coutinho and Daniel Sturridge when fit, can be regarded as unqualified successes. Mario Balotelli's signing is causing the club to be regarded as a laughing stock while it might be tough to locate the person who regarded spending £20m on former Southampton defender Dejan Lovren as a good idea. Balotelli came stamped with warnings from all quarters, yet Liverpool ignored those and somehow believed Rodgers would succeed where Jose Mourinho and Roberto Mancini gave up. Not a chance. And what about Rickie Lambert? If he initially regarded a switch to his boyhood club as a dream move he will hope he soon wakes up from what has been a nightmare. Barely used and looking utterly unsuited when he was, what has been the point? Their specialist strikers (Daniel Sturridge, Mario Balotelli, Rickie Lambert and Fabio Borini) have scored eight Premier League goals between them this season. Everton's back four (Leighton Baines, Seamus Coleman, Phil Jagielka and John Stones) have scored nine. 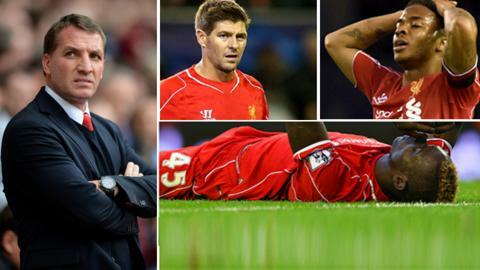 Liverpool simply failed to address the departure of Luis Suarez. It needed a replacement of the highest class, whatever it cost, not cheap punts and failed gambles on Lambert and Balotelli. And does anyone at Anfield even remember the likes of Luis Alberto and Iago Aspas? Liverpool's transfer policy and committee seem to be attempting to circumnavigate a system that cannot be circumnavigated. At least if Rodgers was given more responsibility here, which he should be, owners Fenway Sports Group would know exactly where to pin the blame. A shambles - and one that FSG will want answers about. Are the fans behind Rodgers? Rodgers, rightly, has a reservoir of goodwill among Liverpool's fans after last season but that will run dry if improvements are not made - and quickly. They admire Rodgers as someone who has bought into the history and tradition of Liverpool and likes to play football in a way they admire. There are others, however, who point to how Liverpool have faltered when it mattered and the more fickle - or critical - have been casting envious glances in the direction of Borussia Dortmund's Jurgen Klopp, who is available at the end of the season. If this was an election, Rodgers would just hold the majority but any further signs of deterioration between now and the end of the season might bring a hung parliament at Anfield. Has this season been a failure? Rodgers has had to deal with the loss of Suarez and the injuries to Sturridge but when the public target is a place in the top four as well as a trophy then it is failure when neither objective is achieved. The margins are fine. It would have been a success if Liverpool had claimed a trophy but an exit from a Champions League group that was hardly testing apart from Real Madrid - Basel and Ludogorets are hardly superpowers - and semi-final failures against Chelsea and Aston Villa in the two domestic cup semi-finals cannot be dressed up as success. Can Rodgers turn it around? He will have to otherwise it will cost him his job. What has been seen is that Rodgers, a relatively young manager, has shown he is willing to examine Liverpool's mistakes and flaws and learn from them. The key has to be better summer recruitment. Fail again this summer and Liverpool will not only fall further behind those they challenged so spectacularly last season, the responsibility will eventually land at the door of the manager. Rodgers and the committee - if this seemingly flawed structure is still in place at the start of next season - face defining months throughout the summer and the start of next term. How long will Liverpool wait? After the FA Cup semi-final loss to Villa, all the noises backstage - and from Rodgers himself - were that FSG were still totally committed to the man they appointed in 2012. The scenery shifts quickly in football, however, and as long as Klopp remains on the open market many fans might want Liverpool to at least sound out the possibility. This would be harsh on Rodgers but he is not helped by the statistic that marks him down as the first Liverpool manager since the 1950s not to win a trophy in his first three seasons. Rodgers signed a new contract at the end of last season, believed to take him through until 2018, accompanied by glowing references from Liverpool's owners. Logic and fairness suggests he should still be in place at the start of next season. Rodgers will hope FSG share that view but he must ensure Liverpool make the fastest of starts as the pressure on him will now be intense.